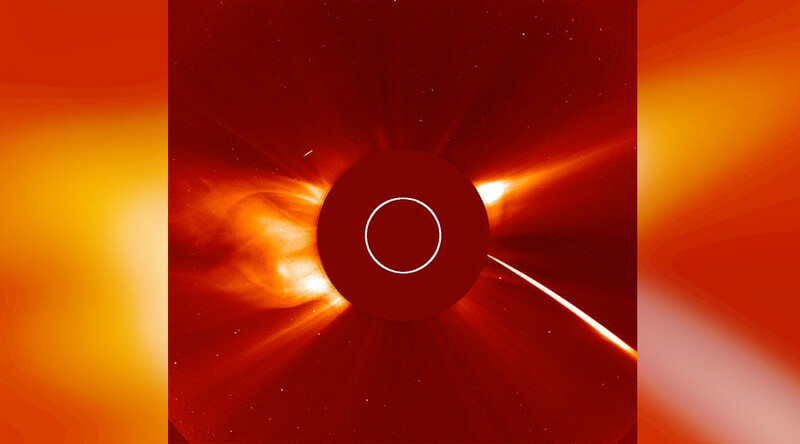 Stunning footage from the European Space Agency (ESA) and NASA’s Solar and Heliospheric Observatory (SOHO) captured a bright ‘sungrazer’ comet as it darted toward our star at colossal speed on Thursday. The space rock, composed of compacted ice and dust, was part of the ‘Kreutz’ family of comets, according to NASA. This ‘sungrazer’ group of comets follows a related orbit in our solar system after breaking off from a huge comet centuries ago. Dozens have already been recorded evaporating in the solar atmosphere. It was first spotted by SOHO researchers on 1 August, just two days before its solar orbit brought it too close for survival. Its arcing trajectory seemed to suggest the comet was aiming for a daring close-quarters orbit of the fiery sphere. However, the sun’s extremely-intense heat 'vaporized' the comet before reaching the other side of our star, according to the space agency.